When she first started her apparel business in and around Chicago (her franchised stores include Once Upon a Child and Plato’s Closet), Elaine Krieger used Krispy Kreme doughnuts as a lure when sweet-talking prospective customers. 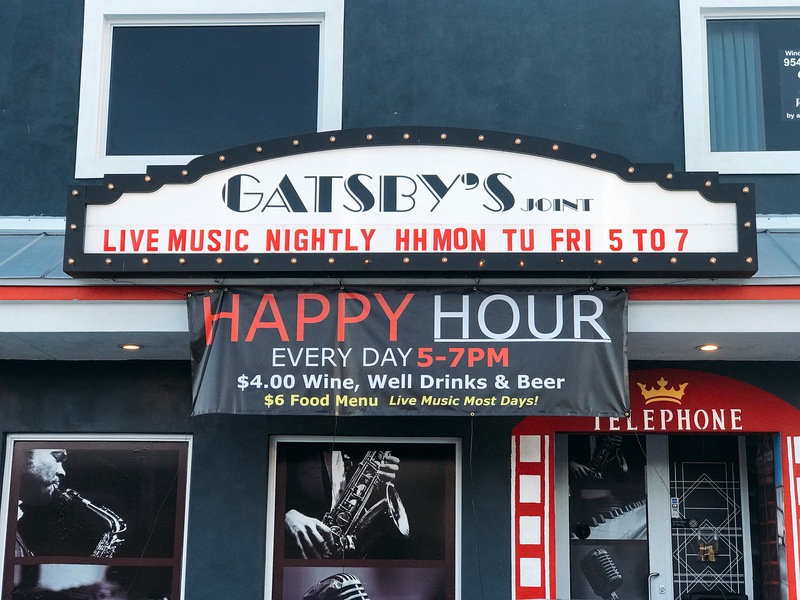 As proprietor of Gatsby’s Joint, Krieger (who still has retail interests in the Midwest) has ditched the doughnuts for a speakeasy-themed restaurant that features a hearty menu—and live music seven nights a week. Don’t be fooled by the menu’s word play. Items like Cat’s Meow Crab Cakes and Puttin’ On the Ritz Pork Chops have more going for them than era-appropriate lingo. Krieger recently snagged a chef from nearby Kaluz to raise the culinary stakes, and it shows in dishes like the perfectly seared and seasoned ribeye steak (pictured), monster scallops with orzo, and ceviche with Argentinian shrimp, pineapple, heirloom tomatoes and red onion. What modern-day speakeasy would be complete without Prohibition-era cocktails? For something different, check out The Flapper (gin or vodka, Champagne, lemon juice and simple syrup) or Aviation (vanilla vodka, pineapple juice and grenadine). Gatsby’s also sports a nicely curated wine menu, with more than 30 offerings.